There’s a small brown bird at the feeder and there’s no one to help you identify it. Don’t you wish you had a personal assistant to help you? 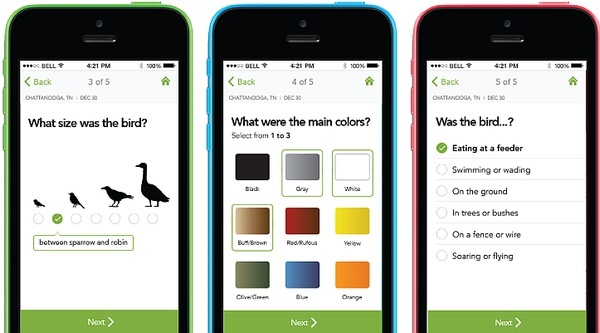 Cornell Lab of Ornithology’s free Merlin Bird ID app for Android and iPhone does just that. Introduced in 2014, the app gets smarter every year. It uses the simple information you already know — your location, the date and the words “small,” “brown,” and “at the bird feeder” — to narrow your choices and identify the bird. You can even take a picture with your cellphone and ask Merlin what it is. Merlin’s answer is a list of the most likely suspects with photos, sounds and descriptions. It even tells you if the bird is uncommon or rare for your date and location. That’s one of the best clues you’ll find anywhere because an “uncommon” species in March can become “common” in May. Watch the video below to see how Merlin works, then download the app. Merlin’s a wizard at identifying birds! p.s. 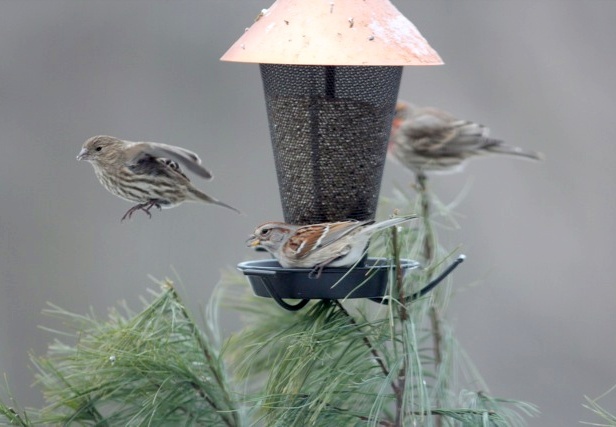 What birds are at Marcy Cunkelman’s feeder shown above? She took the photo in Indiana County, PA, in early February 2014. Female house finch, immature white-crowned sparrow, and male house finch? My guess on the brown bird in the feeder is American Tree Sparrow. Looks like a male and female house finch there with him. Mary Ann, you’re right! Marcy took that photo because the American Tree Sparrow was unusual. We usually have a few American Tree Sparrows hanging around our feeders in the winter. Haven’t seen any this winter though, and we have less White-Throated Sparrows and Juncos than usual also. Tons of Cardinals though. We have at least 5 pairs who hang around our yard. Some of them have actually learned how to hang on the feeder surrounded by a mesh cage and eat from the tube instead of going to the tray feeder. I downloaded the app and am going to have some fun with it. Thank you for this information! I got this app last year, it’s great! Thanks for sharing it Kate.